This is the future we were promised. 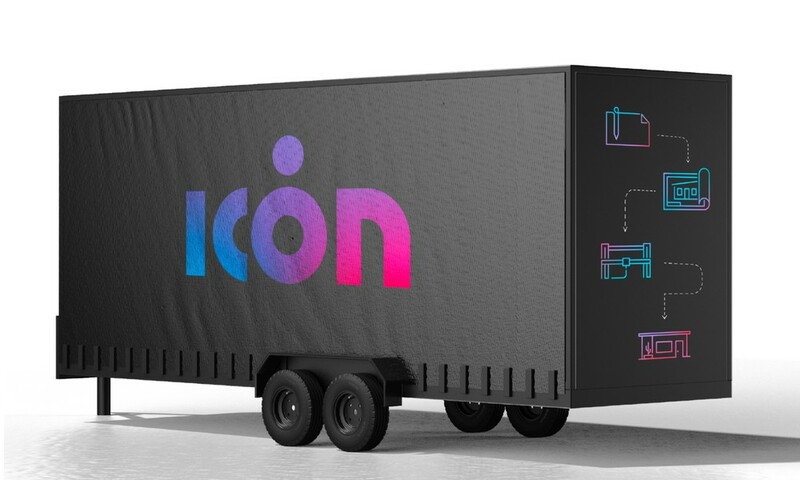 Introducing the ICON platform—a tablet-operated robotic printer, integrated material delivery system, and groundbreaking cement-based material for building homes. When we debuted the the first permitted 3D-printed home in America, we caused quite the stir. Since then, we’ve been hard at work developing new technologies in robotics, software, and advanced materials that push the boundaries of home building capabilities. Gantry system designed to precisely control the deposition on concrete over a large print area. Industrial control software and simple tablet based user interface designed to make it easy to select, design, and print structures. Cement-based mix designed to be pumped and extruded without slumping, bonding between layers, and hardening quickly. Each mix can be programmed for specific attributes. The Vulcan II is ICON's first commercially available construction printer. Designed specifically to produce resilient single-story buildings faster, more affordably, and with more design freedom. It has expanded the footprint of our printing capability to approximately 2,000 square feet. It has an adjustable width (to accommodate different slab sizes) and is transported in our custom trailer with no assembly required. The Vulcan II features intuitive tablet-based controls, remote monitoring and support, onboard LED lighting for printing at night or during low-light conditions, and a custom software suite ensuring set-up, operations, and maintenance are as simple and straightforward as possible. The first digitally-native approach to building construction designed specifically to produce resilient single-story buildings faster, more affordably, and with more design freedom. Vulcan stands 11.5' tall and can print wall structures up to 8.5' tall. Peak power is 35kW. Voltage: 230/240V single phase. Magma requires available water at a usage rate of 2 gallons per minute. Vulcan spans 33' and can print on foundations up to 28' wide. Print length is effectively infinite. Each Vulcan printer provides a tablet-based UI with integrated operating manual. Magma and Vulcan can only be operated with ICON Lavacrete material. Vulcan prints a 1" tall, 2" wide print bead at a linear horizontal operating speed of 5–7" / second. All components are IP66 rated for operating in the elements. The complete Vulcan and Magma print system can be installed and operated with a crew of 4–6 people. The first digitally-native approach to building construction. 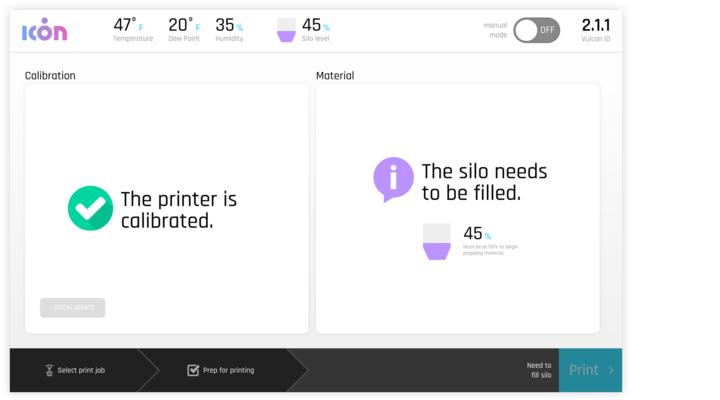 Vulcan comes with an integrated tablet-based operating system for controlling every aspect of print operations via an intuitive, simple, and beautiful user interface. 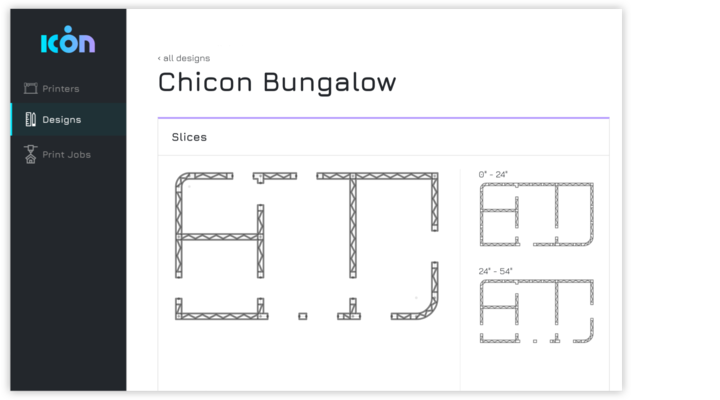 ICON Studio is our powerful CAD and print planning platform. It can translate floor plans into Vulcan print jobs in a matter of minutes and provides pre-print visualization. ICON Control is our intuitive tablet-based control system. We've built the entire operating manual into this control app, eliminating the need for a phone-book-thick instruction guide. Our dynamic motion, environmental, and control sensors enable fast, reliable, and beautiful printing. We capture real-time data down to the millisecond, enabling machine learning and predictive analytics so our machines get smarter over time. 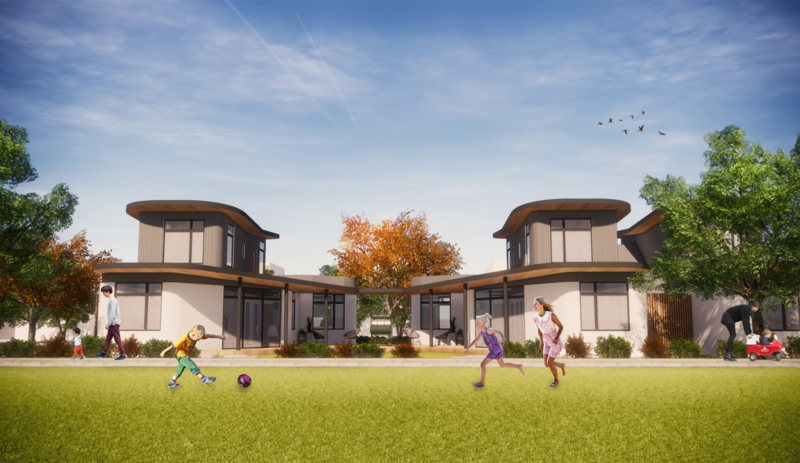 ICON's proprietary Portland Cement-based mix is a closely guarded secret that enables us to rapidly print homes that are beautiful, structurally sound, and cost effective. We've combined easy-to-source raw materials with advanced additives, enabling our material to be sourced from anywhere in the world while retaining material science super powers. Lavacrete has a compressive strength of 6,000 psi, well above the strength existing building materials. Our wall system has been designed to take advantage of the high thermal mass of concrete to maximize both comfort and efficiency. Unlike traditional building materials, Lavacrete is able to withstand extreme weather conditions to minimize the impact of natural disasters. Lavacrete can be printed at high speeds while retaining form, enabling homes to be built faster, keeping construction projects on schedule and on budget. The ICON wall system takes the place of traditional cladding, framing, and sheetrock—delivering a higher quality wall at significantly lower costs. 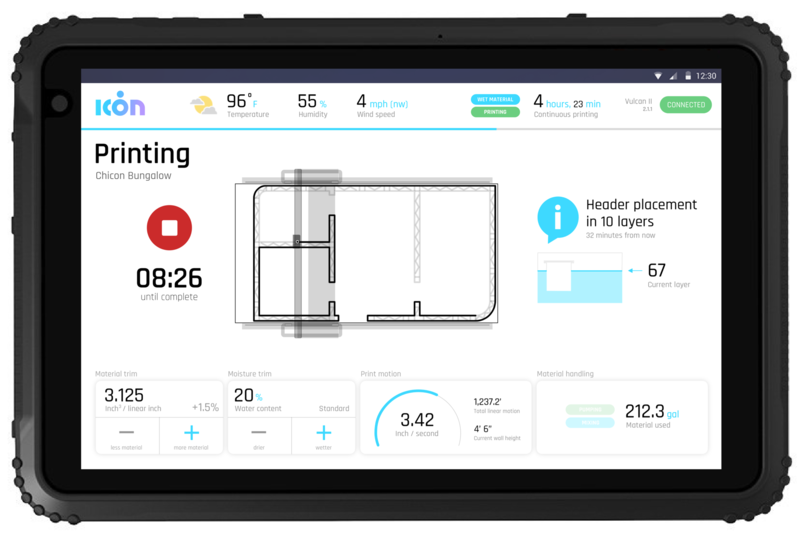 ICON's Magma system is the first end-to-end automated material delivery system for use in 3D printed construction. Using one of ICON's proprietary Lavacrete blends (specific to climate and location) the Magma system mixes Lavacrete, additives, and water automatically from built-in reservoirs. 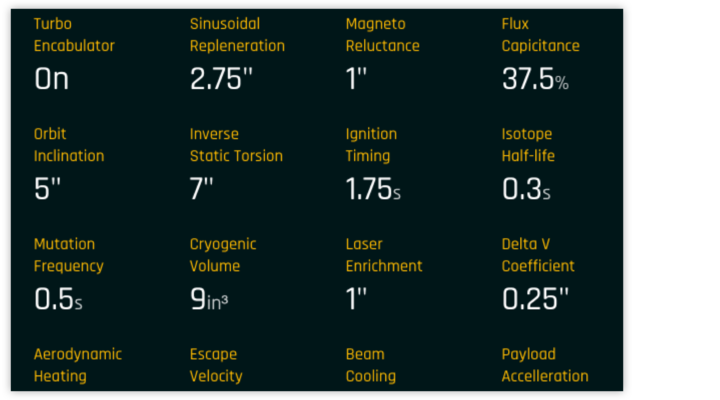 The Magma system then supplies the ready-to-print Lavacrete to the Vulcan II tuned to a specific temperature, humidity, altitude, and speed. With no manual measuring, mixing, or dumping, it's as easy as the push of a button. Check out all of the projects we've been working on. If you're ready to move forward, learn how to get a 3D printer or how to get a 3D printed home.